Modern reproductions of Viking-Age artefacts are often of a really high quality. Indeed, sometimes they are so good that even the experts mistake them for genuine items. 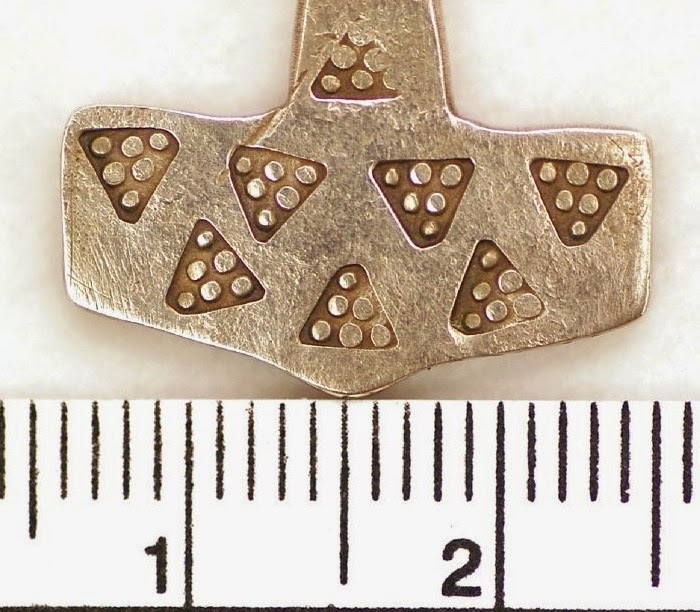 One such ‘fake’ is this Thor’s hammer pendant, said to have been found south of Carlisle. It was acquired by the British Museum in 1990. Thor’s hammers are interpreted as miniature representations of Mjolnir, the mythical hammer of the pagan Norse God Thor. In the Viking Age, both men and women wore them as pendants, probably for protective purposes. At the time of the ‘discovery’ of the Carlisle pendant, only one other Thor’s hammer was known from England (from the Cuerdale hoard). But since then, many more have come to light. In the context of these new finds, a few features of the Carlisle Thor’s hammer stand out. As James Graham-Campbell shows in a recent book, it can now be identified as a modern fake. There are 3 main clues: 2 stylistic, and 1 scientific. The first is its decoration. Triangular stamps are very common on Viking-Age artefacts. But these typically contain just one or three pellets: the use of six pellets, as on this hammer, is extremely unusual. Zooming in to see these triangular stamps up close, it's clear that they have been applied very precisely (although not symmetrically). Indeed, it looks like they were cast in the mould, rather than applied to the pendant after casting. Such precision is unusual. Normally, such stamps are applied casually - they overlap, are unevenly executed and, in general, are a bit wonky. The image on the right shows the stamps on a silver arm-ring from the Vale of York hoard (including triangles with three pellets). These give a much more accurate impression of the true character of Viking stamped decoration. The second feature that raises suspicion is they way the pendant is suspended. The ends of the suspension ring are secured by a rivet. But usually the ends of suspension rings, and indeed rings in general, are simply twisted together. The plain globular knob, through which the suspension ring passes, is also out of place. Thor’s hammers from England usually have either a looped end, as is the case with this example from Norfolk, or a simple perforation through the ‘handle’. But what clinches it for me is its metal content. Analysis at the British Museum revealed that the pendant was made of 93% silver, with the rest being copper. What was missing was gold. Gold naturally occurs in silver and is found in small amounts in most ancient ‘silver’. Crucially, however, it is refined out of modern silver. 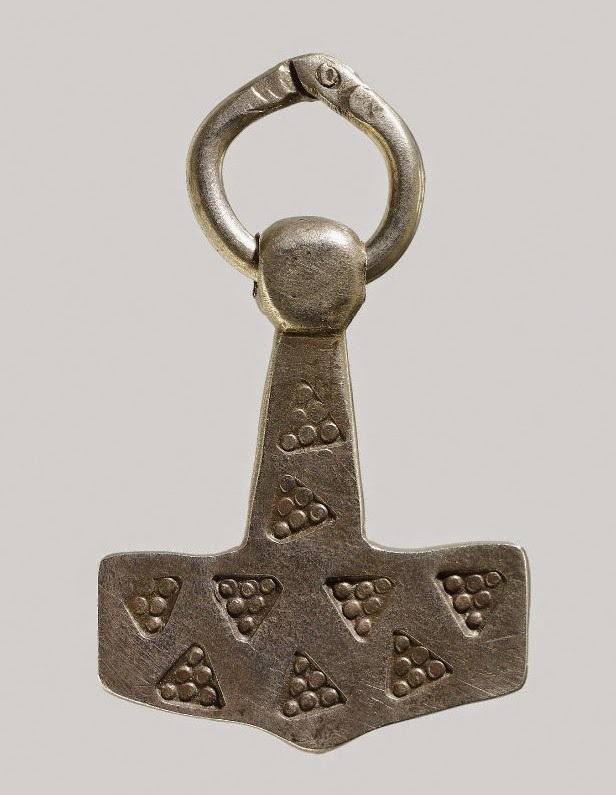 Its absence in this Thor’s hammer therefore suggests that the pendant is modern. So how did the maker of this pendant (whose identity is not known) come up with this design? As James Graham-Campbell points out, in the early 1980s a very popular Vikings Exhibition was held in York. The accompanying exhibition catalogue contains a drawing of a man in reconstructed Viking dress. Around his neck hangs a Thor's hammer decorated with triangular stamps containing 6 pellets. Although it can't be proved, it's likely that this artistic interpretation served as the inspiration for the modern-day forger. Actually I am very surprised the British Museum aquired this Thor's hammer .. I would have seen the diference in the way of stamping the punched dots triangles.. It is disturbing to see (see Ebay) how many modern Thor's hammer casters are trying to sell them as being genuine. Do bear in mind that this was 25 years ago, before we knew that there were Thor's hammers in England! I think there was always suspicion it wasn't real…. And I can't bear to look at Ebay, or indeed supposedly 'genuine' auction sites, both of which peddle obvious fakes - with little consequence. Would you say that the absence of gold in the silver can be viewed as an infallible way of establishing authenticity or? What type of analysis what typically be used in the breakdown of the metal composition? Normally, XRF would be used in museums, which is a surface-only form of analysis. This means the results will reflect the surface composition, which, because of factors such as corrosion or deliberate blanching, may be different from the interior bulk. Also, some recent results suggests that XRF exaggerate the gold content in silver artefacts - so even a reading of 1% may be too high. The only way to be sure, is to take a sample, make a solution, and analyse it (e.g. by ICP-MS). But this is destructive, and expensive, so Museums rarely allow it. 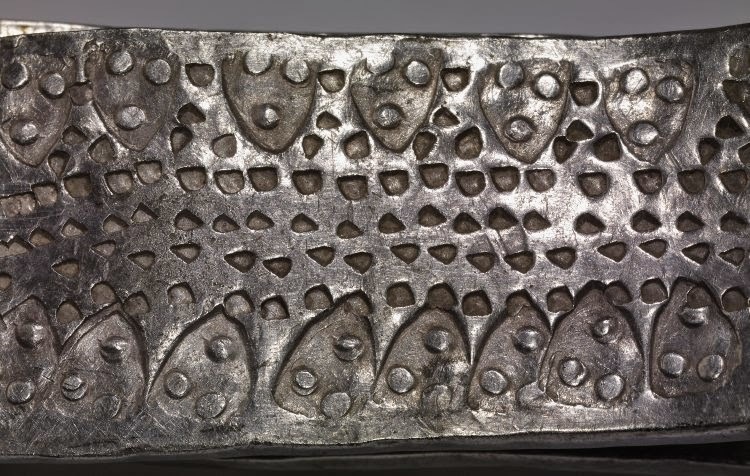 If it the silver has no gold whatsoever, and this has been established by solution analysis, I would say this rules it out as a medieval piece. The only exception would be if parting had been practiced - but the extent of this in the Viking period is uncertain. There is a Thor's hammer in the British museum next to the Viking finds in a glass cabinate with other Viking finds. The hammer, looks like a modern day (Ish) hammer and is in silver with a hook to attach to a cord. It's so beautiful, have a photo of it and like it so much I want to have a copy made! It has a rough finish. I Am curious, can you send me that photograph please? Oh the small pretty one? I know the one you mean. Is actually a modern reproduction and attached to the fire alarm. Excellent article. I am no expert but I can usually spot a fake and there are many on ebay and auction sites. People should question why suddenly all these hammers are being unearthed!! Thunor's Hammers predate the Viking Age and I am thinking in particular of the Gilton one but I do not know when this was discovered. I think you should do a series for BBC4. I don't suppose you give hints as to authenticity of alleged Viking metal items or would perhaps be able to reference one of your publications for similarity? I suppose I'm asking if you would give non-compelling advice on some photos for an appropriate fee? I've noticed quite a lot of gold and silver Thor's Hammer pendants appearing for sale at Timeline Auctions, based in Harwich, Essex. They all look very dodgy and are clearly modern fakes - and all being sold at vastly over inflated prices ! Only 200 genuine hammers recorded in total, or 200 in silver or gold? Amazing, if the former. I am the Principal Investigator of an ERC Starting Grant: Silver and the Origins of the Viking Age. For my publications, please see my webpage. I'm using this space to post updates on my research, and to float new ideas.